Yes, you read that right. And yes, I am the one with unresolved Barbie issues. If you already saw the vlog (video) I posted a few months ago, then you know what I'm talking about! Here's the link to that video in case you feel the need to better understand my childhood and you have a spare 5 minutes or so that you'll never get back. If you decide that you would rather not watch the crazy chocolate woman babbling over-dramatically about her childhood issues (though now I've made you curious, haven't I? ), I can sum it up for you. My parents did not buy me a Barbie doll...ever. *gasp* They did buy me (the supposedly favored eldest daughter) a Skipper - Barbie's short, flat-chested little sister. BUT, they bought my sister 2 different Barbies and a Ken doll! Shocking! Anyway, I've never gotten over it and my sister's Kissing Barbie's pretty pink floral dress is burned into my memory. My friend Katie was well aware of my video and er, issues. She knew just what to do - she got me the perfect Christmas present! YES!!! 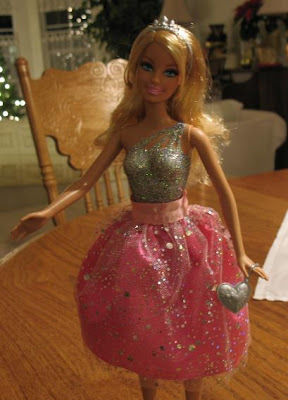 I am now the proud owner of a very cute and glittery Barbie doll! Thank you! I feel that some bitterness has just melted away - LOL! Hey sister's old Kissing Barbie - see that tiara and heart-shaped handbag? That's MY Barbie...uh-huh,YEAH...that's right. Wow - childhood issues resolved. Well, one of them anyway. One of many. Hmmm...I wonder if a friend would be willing to get me a Big Wheel?? Oh my friend. I had tons of Barbies and like 3 Skippers but only 1 Ken. Couldn't ever quite figure that one out! LOL. He got around, I will say that. I also had a Big Wheel with the emergency stop brake on the side! LOL! I still have my Barbies AND my original Lite Brite! In the box! Not Mint condtion! LOL. Big Oh the toys were so simple and so fun back then size hugs to you. Hope you recouped from Christmas my friend. Yes, I had lots of Barbies when I was young. A few Kens (2 or 3, I can't remember), a Skipper. Fun times! I gave them all to a cousin when I grew out of them. She had tons too. We were the only ones in the family who like them so well, I guess. No barbies for me when I was little, but TONS of baby dolls. And, hold onto your hat, I don't allow barbies for my daughters either. Aack! She is one cute Barbie!!! Oh my I was totally jealous of my sister's barbie doll. Her's were so much better then the one I had. If I even had one, I don't even remember, I just remember being jealous of hers! Oh man...my sis, cousins and I had Barbie obsessions...we would play for hours, I mean we're talkin' Barbie marriages, divorces...you name it! Love the post!! Hi Lisa - I had to laugh. I was given only ONE barbie doll when I was around 10. However all my school friends had dozens of barbie dolls and I felt rather left out. Nor did I have the barbie van or any other "extras" and mine wore 'homemade' clothes, not like my friends who had flash bought clothes. AND to make matters worse I gave my barbie to my eldest son when he was little and he broke her arms and head off:( and I had to throw her away. It sounds like I have issues too!!!! This post caught my eye_ as my parents never allowed my sister and I to have Barbies as well. Totally deprived we were:) Glad to see you have finally gotten one.